Two of Super7’s Pocket-Sized Pals are Partying Late Night! Pockets Baseball Boy and Rose Vampire, are charged to light your way through the darkness, and will keep you company on all your evening adventures. 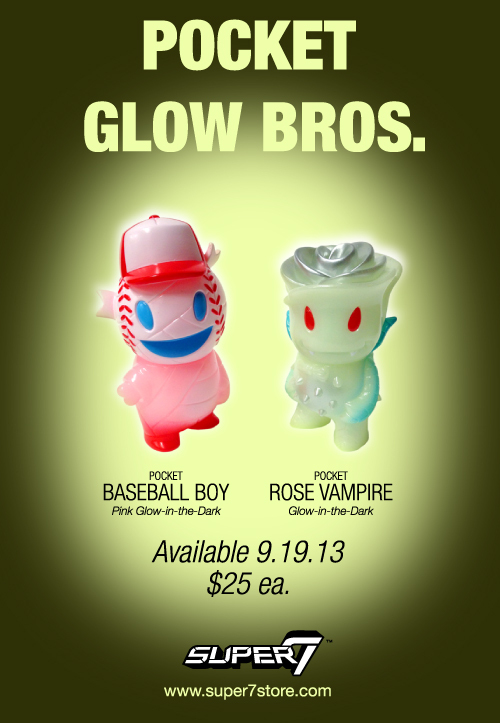 Pocket Baseball Boy is cast in Pink Glow-in-the-Dark vinyl with red, white, and baby blue sprays, while the Pocket Rose Vampire blooms in Glow-in-the-Dark vinyl with red, silver and baby blue. Available Thursday, September 19th, 12 Noon PST.